Let Us Light Your Home or Business! Create the perfect Holiday feel at your home with professional Holiday Lights. We install and take down lights for dozens of homes in the valley. Decorate your business confidently with professional Holiday lights. 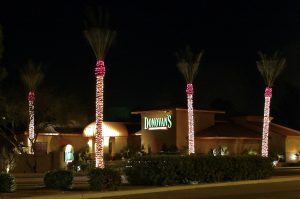 We install as well as take down the lights and proudly serve dozens of businesses around the valley. 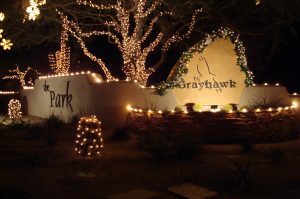 We have an extensive portfolio, providing Holiday lights for the cities of Scottsdale and Coppel. For more information about our city lighting services click the link below. With 30 years of experience in holiday lighting and design, we can offer proper estimates that are completely custom to your wishes. Having that experience also makes us the SAFE choice. We are OSHA certified and have regular safety meeting with our crews. Let us, at CHL, save you the time and take the pressure out of holiday lighting this year. 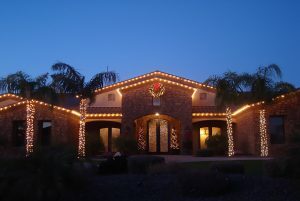 We are one of The Valley’s top trusted holiday lighting experts. So, before you spend time unraveling those tangled lights or attempting the daunting task of cactus lighting, call us to schedule your FREE consultation. We can lease the lights for your home, outdoor Christmas trees, outdoor landscape, and even create custom garlands and wreaths. Learn more about our outstanding products!